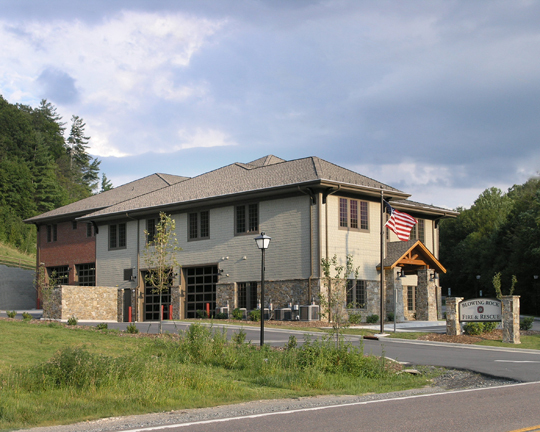 Unusual site challenges, location, and requirements for the Town of Blowing Rock Fire and Rescue services molded a unique architectural solution for their building, which has become a community landmark. Combining EMS and Fire, the department required substantially more space. During the service life of the new station the department would transition from an all-volunteer to a full-time, paid department. Circulation remained key for rapid response from all areas of the building. Space needs included EMS with two drive-through bays and living quarters; and Fire Department with four drive-through bays, support spaces and emergency response administrative space. As a tourist destination, it was imperative to reflect and reinforce the architectural character of the Town of Blowing Rock. Use of stone, burgundy brick, heavy timber framing, siding or shingles, and sloping shingled roofs was mandated. "As a tourist destination, it was imperative to reflect and reinforce the architectural character of the Town of Blowing Rock."